How Did Organic Traffic Increased 3 Times in One Months? I've been blogging since 2003. The first times are completely traffic-focused writers, so I read how many people I can help out each day. But especially since 2010 I have been approached only on the basis of the relevant people's reading. I chose the target as a whole. I chose the standard "1000 people" as the standard instead of the 300 word "barriers" that resulted in the classical "people are reading now" approach. I have been trying to write about 1000 words every summer for the last 1-2 years. This decision really changed the readership very strikingly. The average time spent on the page is around 4 minutes. As I follow Hotjar, the average score of the last paragraphs of the articles is around 40%. In fact, I am trying to write, to look around and go crazy, often without using intermediate headlines and visuals. I think it was successful. However, I especially thought that Hamza Şamlıoğlu should be the reason to hear that 80% of the traffic he received is organic. My traffic from organic traffic was 25%. I have come up with a road map to balance this situation and have worked hard on it for the past month. I briefly talk about what I'm doing. I turned off the AMP, which I hate first, and especially the pages that I am expecting to convert, which is a terrible user experience. AMP is a great feature for slow-opening pages on the mobile, but it seems to me that it's pretty unnecessary for fast pop-ups. I do not think I need to hurry to pass, especially since I do not have the system at all. Organic arrivals increased by 30% after the closure of the AMP. I have not done keyword-focused work on any article I've written so far. I spent a few nights on this, but I turned all the articles into individual keyword-focused ones. Keyword Planner was effective when determining keywords, but I would like to point out that I am thinking about how to make new calls. Because 15% of the calls are made from calls that have never been done before. I have never tried to sit in manual at the point of indenting until now. In this regard, I rely on an extension, which automatically links all the posts to the internal link. The plug-in is broken des It is still taking a lot of time to write all the articles one by one, even if it still can be done better. As a result of the internal links, I witnessed serious increases in the keywords I targeted. This simple but effective rule social media consulting She brought me to the first page. I did not have the most prominent visuals of old writings. Because the blog did not need anything like that. But I noticed that the content at the end of the article and the social media are in trouble. I do not yet have a clear picture of how exactly this is happening, but I think it will increase intra-site navigation. I added a highlighted visual to all the letters. The visuals on the Google side were not particularly influenced by the lack of custom design. It would be interesting, but I did not have a 404 page. All 404s were 301 on the main page. I corrected this terrible mistake. New 404 pages not very creative but I think it was nice. I translated all the articles on the site into English. I am using the Google Translate API for this. There is not one or two ridiculous translations, but in practice it was a good result. This update is more recent, it will display 4000 out of zero, but we will see how it will affect the time. I translated my blog into English. What other language should you translate? I do not know if my followers have trolled me, but I will translate into Chinese for a month or two. I am going to try to add one new language every month for that reason. Of course, I do not even think about what to do with the API if I continue to set up such cues. Let's see how to translate the "spending" part. One of the most exciting developments was my mini-experiment with Google Tag Manager. I am a person who places great importance on the site schema.org code. But I did not find a plugin that could place all the schema code in all the content. The best plug-in has a maximum of 8 different code structures. When I decide to make manual edits to overcome this, it is not always suicidal to be able to add 3-4 different codes whenever the content comes in. Instead, I've defined variables in Google Tag Manager. Through the CSS selector, I overwrite the values ​​of the title such as title, description, etc. I have also added these variables so that the relevant pages are automatically updated on schema.org patterns. There are a few more code structures that I still need to add, but I am happy to see that the code works fine. I have even done a psychopathic update on visuals. The tools that measure the speed of the site often put people into a misconception. Just because you've checked the main page, you can feel the speed of the entire site. In order to increase the speed values ​​on all pages, I have to make up the mistakes I made so far. I have converted all the images from PNG to JPG. You need to manually edit this code in many places. Over 4000 images on the site have been compressed JPG, reduced the quality to 80. I earned about 150MB according to the calculations. According to Analytics, although the number of visits from abroad increased, the average load time decreased from 18 seconds to 9 seconds. As a result of all these updates, the number of organic visits has increased threefold. Yes, not so many millions, but the average session is not a huge change in the assumption that there is still a mass audience that is still the right target audience. Because Google does not tell us all the ways in the search engine optimization process, we are developing our strategies based on more personal experiences. Usually someone in a blog in its sector in Turkey SEO experts abroad, get in here exactly as if capable of getting a result that is experienced in their country and use. As a result, the strategy does not work. However, this kind of experimentation results in a great information pollution that results in mistakes. I have now compiled a compilation of the SEO legends we need to stop believing. Google's submit URL You really do not need to use the link. Google does not guarantee anything when you post your link here. The spiders are already doing indexing already. The working logic of the spiders is as follows; when a web page is scanned, all links on that page are scanned in the same way. It will be scanned on other connections on the page that is being scanned on other connections. for example Growth Hacking Consulting backlinkte that I gave you in the form of the site 29 internal link will also scan the Google one by one. Yes, in the early 2000s, we tried to get backlinks from as many places as possible. First, the number of these links was taken as a criterion, then the PR value of the links was taken as a criterion, and now a number of algorithms are working at the back. Backlinks have been released until the Penguin 2.0 update in 2013. However, you will need to buy a full-time editor or a few editors who will write backlinks for your site instead of money. Remember, quality content will already bring your own backlinkini. If you own an SSL certificate there is little effect, you can now shovel. Especially as the verification rate of the SSL certificate you receive increases, the value that Google gives to your site is increasing. You need to print your finger here, if you need to talk about free SSL certificates, yes we can not say that they work too much. However, SSL certificates that reflect your site, your company, your company name to the browser should be your first choice. There are still people who think that we will get you first place on Google. Some more cautious people say that we will now take the first page. But those who say it can not understand what SEO is. SEO is not about getting out of the top, but about getting the right people to come up with the right pages. If you are in the first place and you are suffering from garbage traffic, the investment you have made is wasted. On the other hand, people do not look at only the top 3 in the SERP. Rich Snippet integrations are noteworthy, especially when searching for products. So do you have a video? Is there a star? Any comment? Does it say the lowest price? as. SEO is not only the first step, it also includes clicking on the site. It does not. It has been announced for years that Google's meta description and keywords will no longer affect ranking. The description text that you have written for your editorial will only allow the user to view and click on the SERP. There is absolutely no effect on the order. Admit, did not you think that Google did not like pop-ups? I need to correct the sentence. Google does not like misused pop-ups. If the user can not access the content because of the pop-up, yes, Google will not like it. Especially if the mobile is not able to close the pop-up, if the user is annoying, you need to edit the pop-up immediately. Pop-ups should not pop up after a few minutes or a couple of pages, not pop-up entire screen. How to make your site compatible with semantic search As I explained in the beginning, the keyword is not focused. The algorithms connected to the artificial intelligence working on the back side read the word phrases. We can even say that you understand what you wrote. It is easy to understand that you are in the context of keywords regardless of the context. The artificial intelligence practice Google gave to RankBrain is how it would be. Now you can understand what you've added to your key. So you do not need to write your exact keymap in your content, either through repeatedly repeating your keygraph or by getting the stimulus given by Yoast. Google does not really care about the word density on your homepage so you can go up in the top positions on the keywords you focus on. You should optimize your home page to better understand your business and make it happen. Google absolutely "Aaa few words used on the main page, stop, I do not fall" he says. How can we make our site compatible with semantic search? SEO is a jungle full of known mistakes. It's true that most of the known mistakes are related to keyword selection. In keyword choices, SEO comes from tools that we use the biggest impact on newcomers. Because we are trying to do SEO without understanding the logic of SEO. SEO is always the first thing to do: "SEO is not about deceiving Google, it's about showing the right content to the right user." SEO Specialists are generally tools-dependent, so they optimize their content according to their tools. Only the tools give us only percentages and numbers. Take Yoast SEO for example. There is no one who does not meet Yoast using WordPress. One of Yoast's in-font metrics is the keyword usage rate. Often these miners say that keyword use should be at least 2%. In the past, there were those who raised these rates by up to 10%. However, Google's algorithms now punish content created in this way. The speed is changing. I will explain why. LSI Keywords (Latent Semantic Indexing Keywords) are the key words we need to know when determining our key words. In the past we only added keywords. For Google, the author writes a text that would never understand what he was talking about when he was reading a reader, and sat in the first place. The reader did not understand because we used a key word every 5 words. Then my life entered long-tail keywords. It's like now our content becomes more understandable. Now the last point of the key words is the semantic key words. It now punishes Google stuffers and rewards those who use LSI Keywords. Think about selling apples in the US. You need to climb the top of the apple. However, your biggest rival is Apple Inc. Apple is coming out against those who want to buy apples. We will have to take advantage of LSI to overcome this. I will explain it with an example. We're working on car repair. What did we do in our articles in the past? According to some people, automobile repairing is used in a certain place, according to some people, we think that we optimize the writing. Not anymore. Once in our production, the car will go through repair. Then we will have to pass words such as auto repair, diesel engine repair, car repair, vehicle repair, engine rektifiye. When setting your keywords, you do not really need to change the way we use the standard. After using a tool like Ubersuggest and getting hundreds of key words preemptive, we start to think like "normal user". What key words would the normal user want to pass to this article? We select these key words in Ubersuggest and start using them. Of course, the most commonly used method is the keyword in the bottom of the results page in Google searches. Where should LSI Keywords be used? Your keywords should be used in Title, Description, Heading Tags, Anchor texts, and in the last and first phrases of paragraphs, even if they are not exact matches (recommended). Semantic searches are now the future of search engines. In order to be fully compatible with the semantic search, it is necessary to complete the transition process to LSI Keywords quickly. In all our articles we need to develop word strategies that are suitable for semantic search, to edit these words over long-tail, and to remove them from the first rule as much as possible: You write your script for the user, not Google. Research shows that SEO works are centered on Backlink Tree studies. Without a healthy backlink tree, your chances of rising in a competitive word are almost zero. But backlink purchasing is also a difficult job. The first question that often comes to mind from SEO experts is where do you get backlinks? is happening. There are a couple of classic tactics you can get as a result of a quick search on Google. I will not talk about blog tactics like comments or guest authorship, which are now very cliched and obviously do not work with recent algorithm changes. At the same time as BlogRoll or low-quality site-filled Dictionary, you just enter the proposal will be a loss will be. Although Google Plus has lost its popularity, there is a great area for SEO specialists. Story part of About. This field is a field that can provide us with a dofollow link. Using your anchor text you can get links to both the page and the Profile. References are indispensable for landing pages. The visitor's confidence can be reached with the easiest references. Then turn it on. List all the organizations you work with, see if they have reviewed all of their websites and included references. (Work with the institutions that even offer them.) Then contact them and ask them to add you. This method is actually one of the most healthy backlink acquisition methods. Quora Q & A is the largest media in the field. There are so many people following this campaign. Take advantage of Quora's strength. Help people in Quora. Your mark may open membership in Quora and may provide answers to each and every question on the relevant issues. The links you will use in your answers will allow you to get a link to a quality site like Quora. Use Semrush's Brand Monitoring feature to keep track of where your key words go. As long as you do not have a competitor using your keychain, you have an opportunity. Communicate with all the sites that use your keystroke and gently request your link attachments. Press releases are an opportunity not to be missed for you to hit the table. The problem is that they publish your newsletter, but they will not promote it on the main page. The first thing we need to do is pay attention to our newsletter as a viral newsletter. The other thing we need to do is to include links to the newsletter. Even if they do not move to the main page, at least they can get a backlink. Generally, 10% of the news sites you send will publish your content in a linked form. The reports you publish in Slideshare can reach hundreds of thousands of times. Every new person you visit will viralize your content a little more and get backlink from your viral content, even more valuable. Remember, you must convert the file to .pdf before uploading the file to Slideshare. Do not forget to add links into your report or presentation. Although designing infogistics seems a bit difficult, it is a content that is irreplaceable for the community that follows you. Infographics are becoming more viral and easier to publish by other blogs and news sources. Again, since infographics are published, there is a higher rate of backlinking, since they contain data. Even if you do not have design knowledge to design an infographic, there are systems to design at very reasonable prices. I have taken the best quality backlinks I have taken so far through a research. mini about the situation in the social media of TV channels in Turkey, they had prepared a report to the press service. The news agencies have gone through the research and news has been reported in over 2000 news sites. It took only one day to prepare the report. Prepare mini-reports about your industry. Avoid giving too much technical information in these reports because if you want your content to be published by more organizations, it should be on a level that everyone can understand. Add a few visuals to your report and mention a few comments at the end of the report. Quality content publishers will close your content in the air. Taking a backlink from Wikipedia might be the first thing to come to mind when it comes to spam. No, we hate spam. All of your content that contains definitions, information, data, can be used as a source in Wikipedia. You can get high quality backlinks by searching for topics related to your domain and adding related topics and showing references. A little tip: try to be a Wikipedia Editor if you can, if you can not, try to meet a few editors. Choose one of the most controversial, most controversial topics in your industry and organize a blog contest on that topic. Write about your topic on Blogger's blogs and earn a prize from you, the owner of the most acclaimed post as a result of popular vote. If you can make a good announcement, you will receive no backlinks account. Publish small tools near your main job. the Semrush berush and SeoQuake I like their work very much in this direction. They also have the opportunity to introduce themselves while making it easier for employees in the industry to work freely. Similar tools will provide both a constant visitor volume that will benefit your recognition, as well as allow you to get backlinks from places you have never guessed. There is a lot of nonsense tactics circulating on the internet because of SEO tactics. Some of these need to be emphasized. Never go into a lot of unrelated sites and do not spam. Do not write a bot that spam comments and make comments on thousands of sites. Distribute free WordPress theme and do not get backlinks from all of them. Do not buy backlinks, buy native content if you are going to buy anything. WordPress, Tumblr, etc. Do not open the blogs and give yourself a link. Do not put your link in the ridiculous visitor books just with the .gov extension. 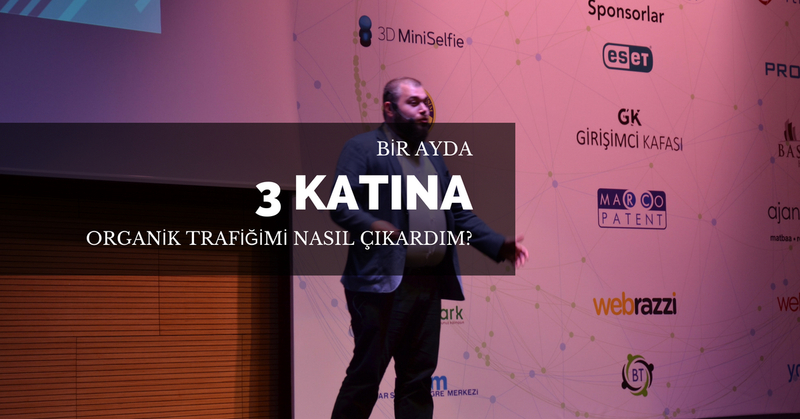 * This article was first published by Haydar Özkömürcü on the Semrush blog.